Every artist knows that a break in repetitive pattern draws the eye. Similarly, continuing a seamless pattern creates a balanced, harmonious effect. In fashion, we can use these principles to our advantage to create a magnificent look by properly matching prints and patterns. Note: Check out encyclopedia of patterns for terms or pattern types you may not recognize or need more information about. There are two types of patterns: organic and geometric. Organic patterns are patterns that are inspired by nature. They are typically swirly, complex, and sometimes difficult to “see” how the pattern repeats itself. A floral pattern is an example of an organic pattern. Geometric patterns use geometric shapes, often sharp and uniform to create a pattern that is easy to identify the repeating motif. Polka dots, plaids, and stripes are examples of geometric patterns. When matching patterns, it helps to limit your space to three patterns. This is not a hard and fast rule but should generally be followed, especially when first starting out. Contrary to popular opinion, patterns don’t have to match. They can be combined in a variety of ways including size, color, and style. Finally, the size of the pattern should relate to its purpose. In general, large patterns work well for large projects such as curtains and rugs while smaller patterns work well for smaller projects such as clothing. As with the pattern-space rule, this is a generality, not a hard and fast, unbreakable rule. Follow these steps to properly match patterns and remember, it’s more important to match colors in the patterns than the print itself. First, pick a pattern or print you wish to use for your base (or “hero” pattern). This is the pattern you will start with and build your outfit around. It is the dominate element in your piece and will make the strongest statement. Often times a large-scale pattern is easiest to begin with. Determine if the pattern is geometric or organic. Remember, organic patterns typically represent nature-oriented motifs while geometric patterns represent geometric shapes or lines. Looking back at your base pattern, decide which color you wish to bring out. This will be the color you use in your second pattern element. Pick the second pattern. Make it the opposite of your base pattern type. For instance, if your base pattern is floral, choose a geometric pattern for your second element. If your base pattern is geometric, your second pattern should be an organic pattern. When picking the second pattern, consider the size of your base pattern – small, medium, or large. You can use the same size for your second pattern element, but it is usually easier to pick a second pattern that is half the size of the base pattern. For the third and final element, use the opposite size you chose for your base and secondary patterns. If the first and second patterns are small, use a large pattern for the third piece. If your first and second patterns are large, use a small pattern for the third piece. If you chose different sizes for your base and secondary patterns, the pattern size of your third piece can match either one. Finally, make sure you match a color in the third piece with a color in the base piece. 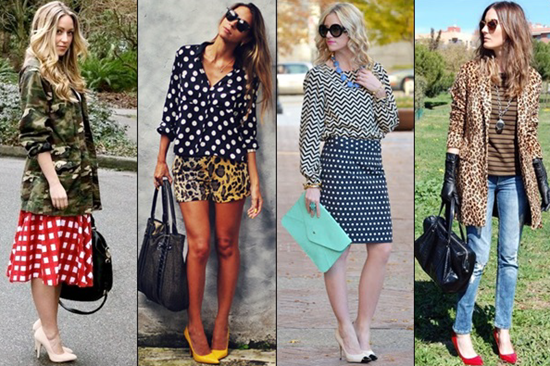 When it comes to matching patterns and prints, match colors, not prints. Matching prints and patterns is not a hard science. It’s perfectly okay to experiment. Below are additional hints, tips, and considerations you can try when matching patterns and prints. Try pairing mixed prints with neutrals. Try using the same pattern but inverting the colors. Think of stripes as a neutral color. Try pairing two types of the same print (e.g. floral top with floral bottom) but with bold, contrasting colors. Trying mixing prints or prints of different scales, one smaller, the other larger. Trying using two different prints that share a color. The simpler the print, the easier it is to mix. Think about stripes or leopard prints. They are simple, and like neutrals, go with just about anything. A shirt tied around the waist, belt, and textured fabrics can be used in place of a print. It easiest to stay within the same palette for each pattern. If your base piece is bright, choose complementary patterns that are in the same color story. If you feel the patterns you picked make the outfit look too busy, add a solid or neutral to the mix. Don’t forget to consider the silhouette of the outfit. You don’t want the silhouette to detract from the graphics you want to show off. A fool-proof way to print mix is to match a lighter print with a darker one. If you mix three vibrant prints, choose colors that are evenly spaced out on the color wheel, like yellow, blue and mauve. 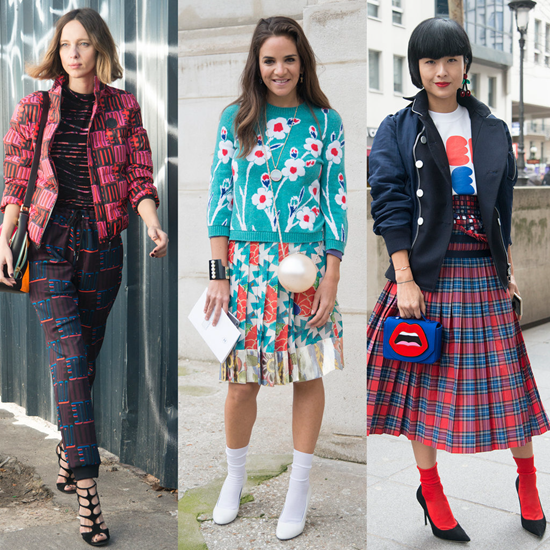 If it’s still too loud, tone it down with a solid print or neutral color. Previous post: Fabric and textile pattern encyclopedia – complete pattern dictionary illustrating the various types of patterns used in fabric, textile, and clothing design.